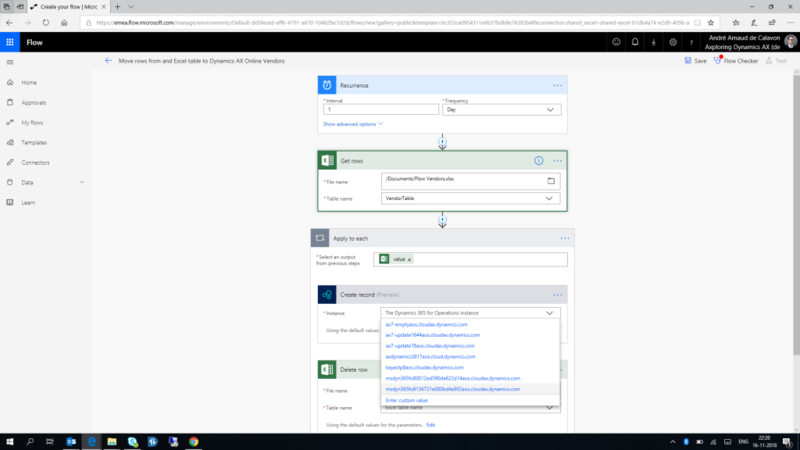 After spending some time with building some automation for Microsoft Dynamics 365 for Finance and Operations with Microsoft Flow, it would be a good timing to write some blogs. 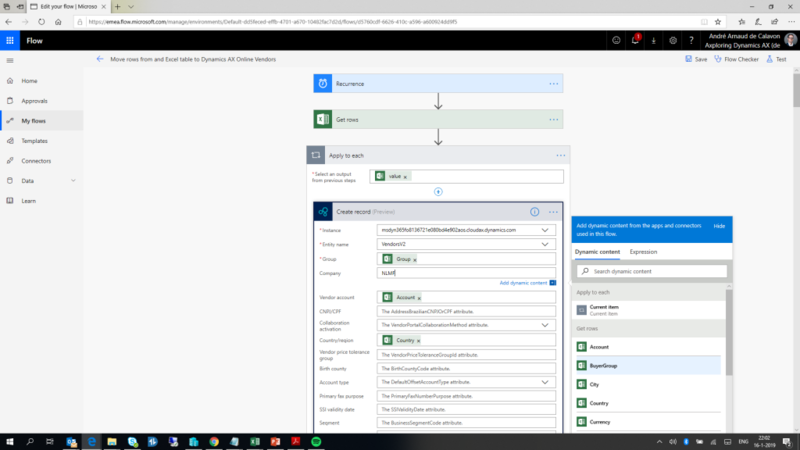 The intention is to help you getting started understanding the Microsoft Flow tool and build your own business automations. 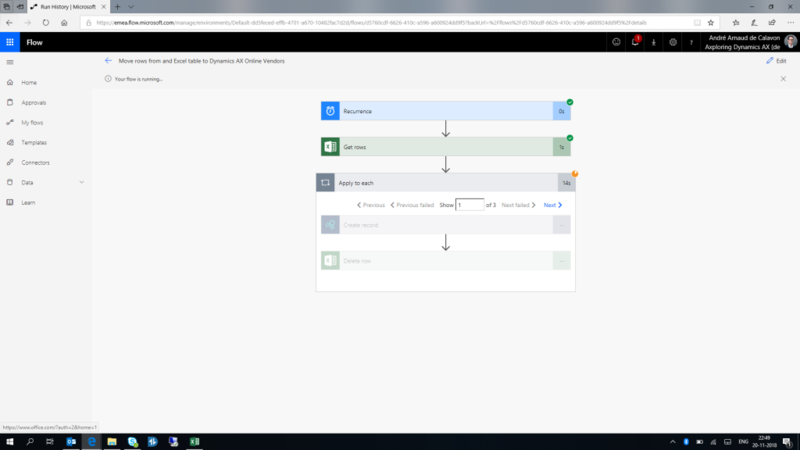 This is the first part where I will explain the experience to sign up for Microsoft Flow and create your first automation to interact with Microsoft Dynamics 365 for Finance and Operations. 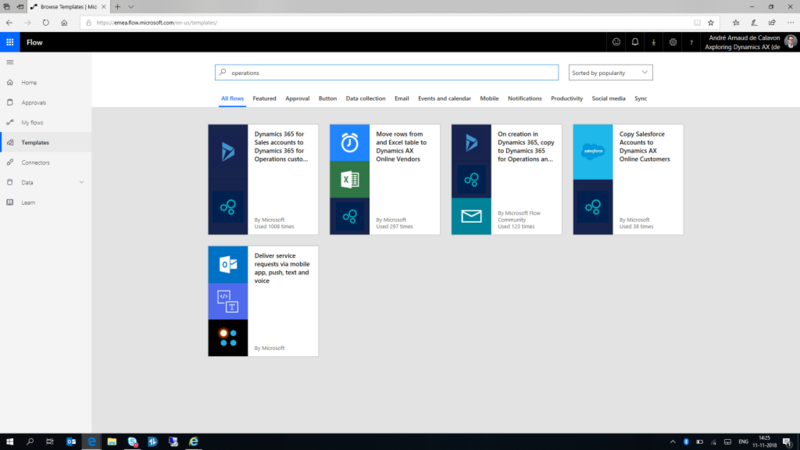 First of all, it is good to know that basics of Microsoft Flow is part of the Microsoft Dynamics 365 subscription. 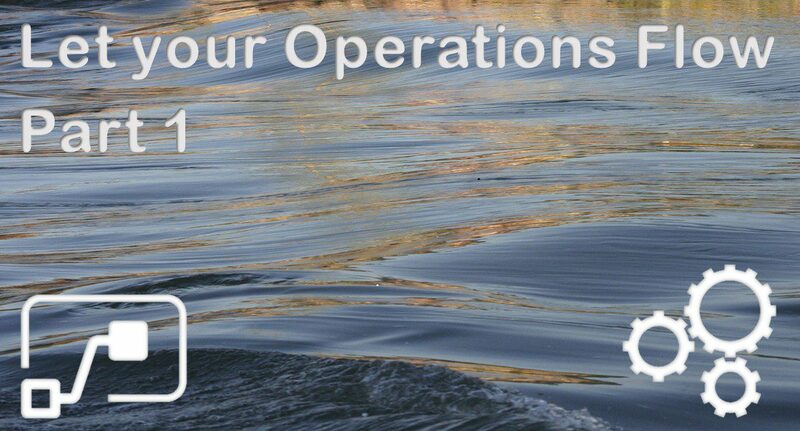 If you need additional Flow licenses depends on factors like which connectors you need to use and how many Flow executions you need each month. 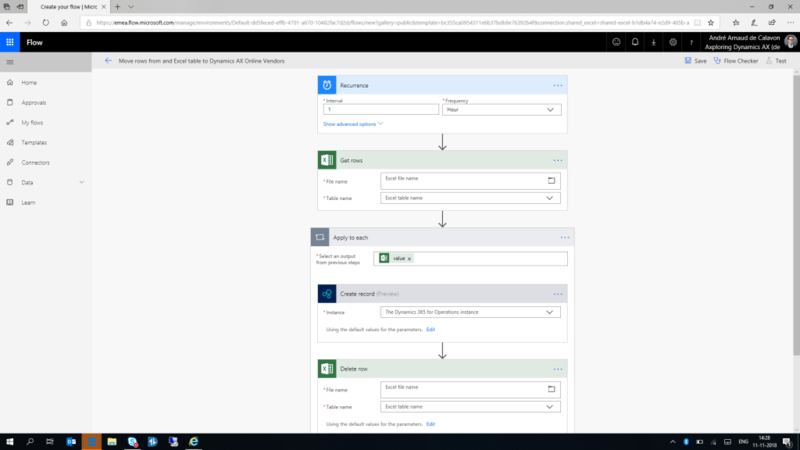 Pricing can be found on the next page: Microsoft Flow – Pricing. 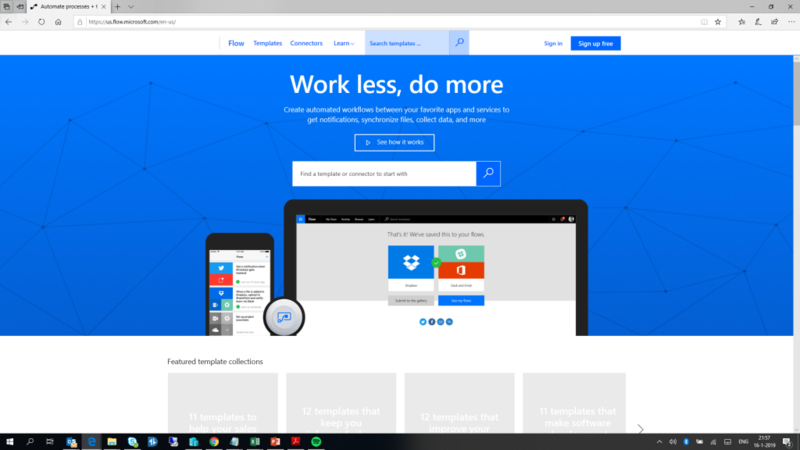 When you want to sign up for using Flow, you can go to the home page of Microsoft Flow. 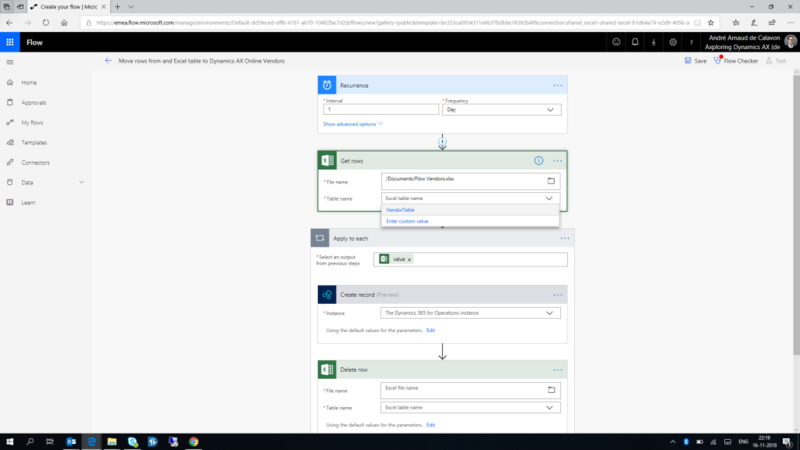 Then login with your organizational account or sign up for free, to get access to Microsoft Flow. As you will notice, you will start with an empty environment. When you click the button Explore Templates, you can search for examples. In this case, I searched for Operations to see if there are any templates available. 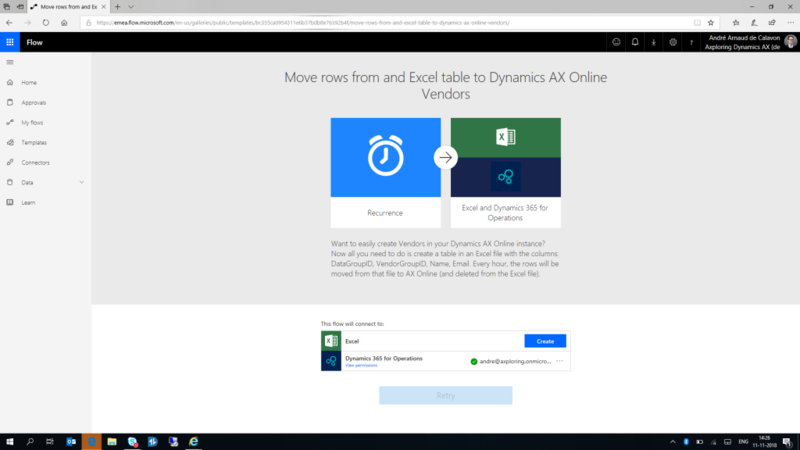 The template to move rows from Excel to Microsoft Dynamics 365 looks interesting to start with. Note that the templates are using some legacy names for Microsoft Dynamics 365 for Finance and Operations. I do expect that this will be changed in future to align with the current product naming. 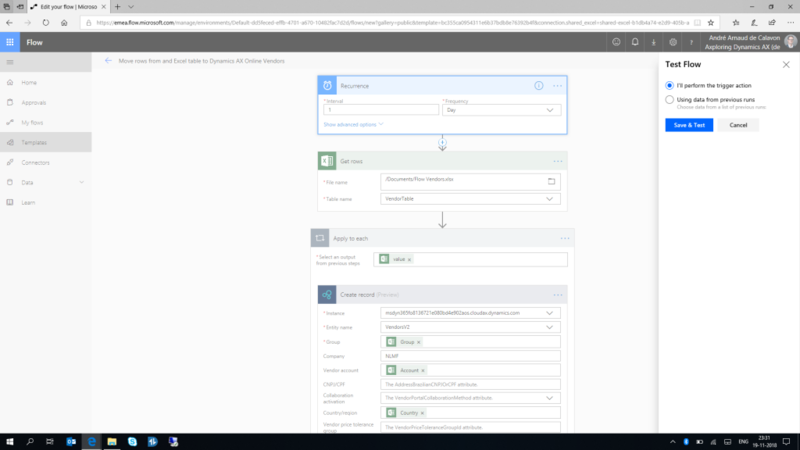 When you have selected a template, Flow will assume it will use your login credentials to also connect to a Dynamics 365 instance. Click Create to continue. This example starts with a trigger to run the flow using a recurrent schedule. You can change the interval if you like. 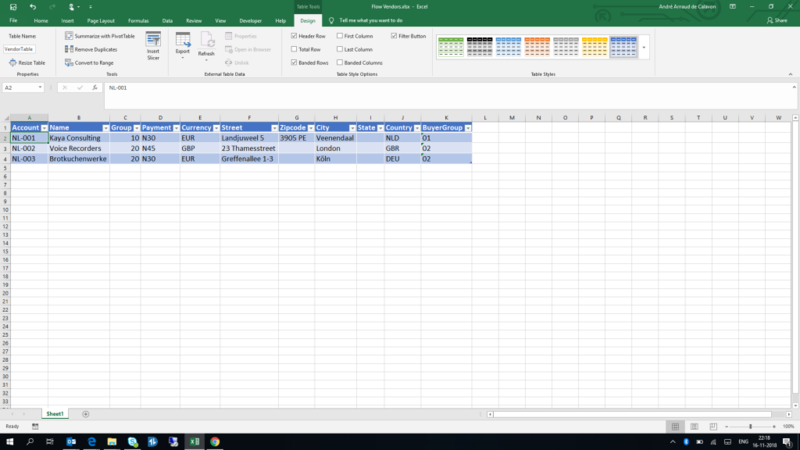 The next block is an Excel action to get rows. for this demo, I created a sheet with just a few fields and rows. 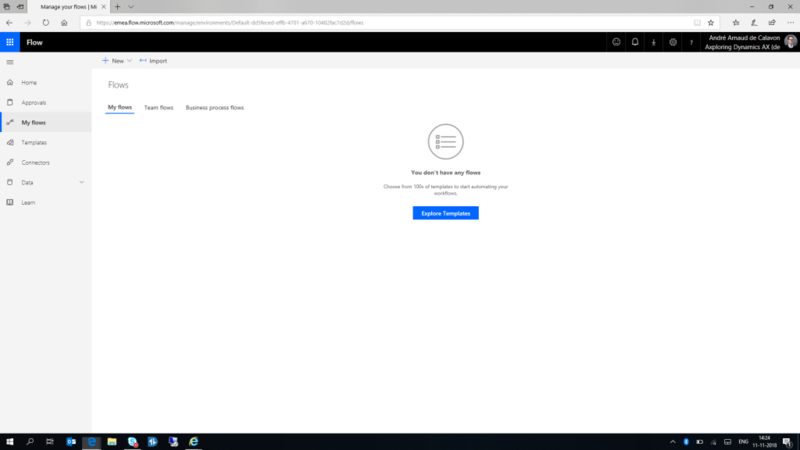 I saved this sheet on my OneDrive for Business. Note that the data should be present in a named table in the Excel sheet. In this example the name is VendorTable. You can lookup the file name and then the Table name lookup will show you all tables present in the Excel file. The block Apply to each is used to loop all rows for a given result set. In this case it is the collection of Excel rows from the table. Now we arrived at an interested part of the Flow. 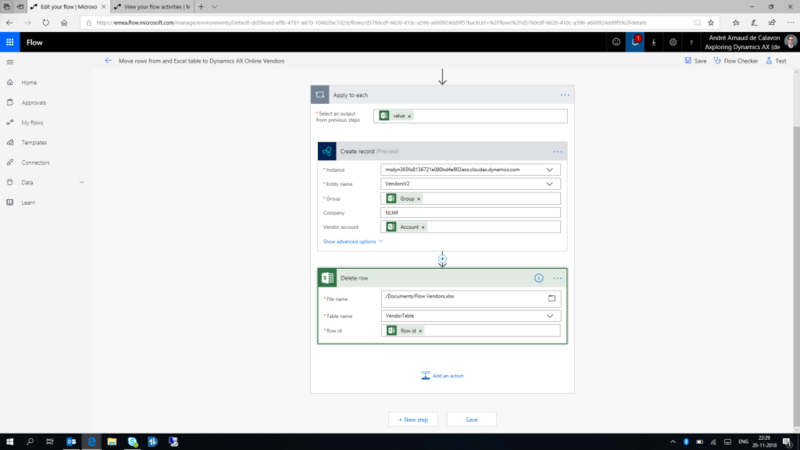 The Create record action is an action of Microsoft Dynamics 365 for Finance and Operations. 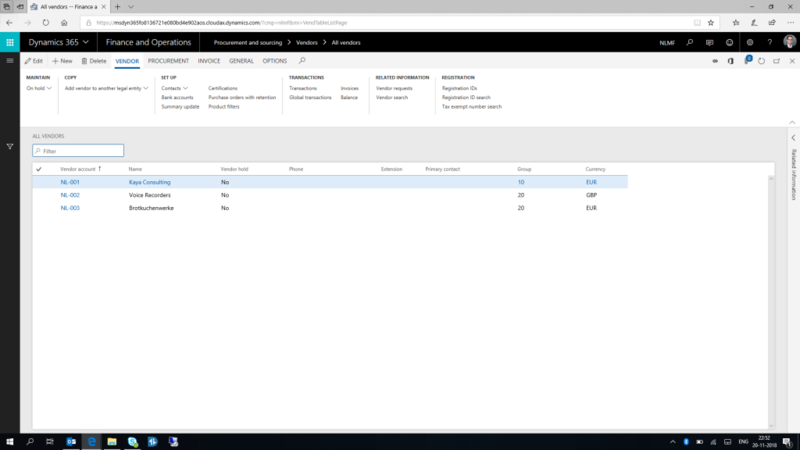 If you open the Instance lookup, you would see all environments of Microsoft Dynamics 365 for Finance and Operations where you have access as primary tenant. Select the environment where you want to test importing the vendors. When the Instance setting is correct, you will have an option to change the Entity name. The Vendors entity is provided in the example. As there is a later version available, I did change it to VendorsV2. When you expand the list with fields, you can map the variables from the Excel file quite easy. Select a field name; then a value from the Dynamic content. It will copy the value into the field name. My Excel file does not have a Company identification. For this reason, I did fix the value to be NLMF (new created company in my test environment). The next action will delete the rows from the Excel table once they are imported. You again have to provide the file name and table name. Once the setup is complete, you can run a Test. It will actually execute the Flow and will process the contents of the Excel file. For a next run, you can enter new vendors in the same sheet. If you don’t want to delete the rows, you can remove this action block. 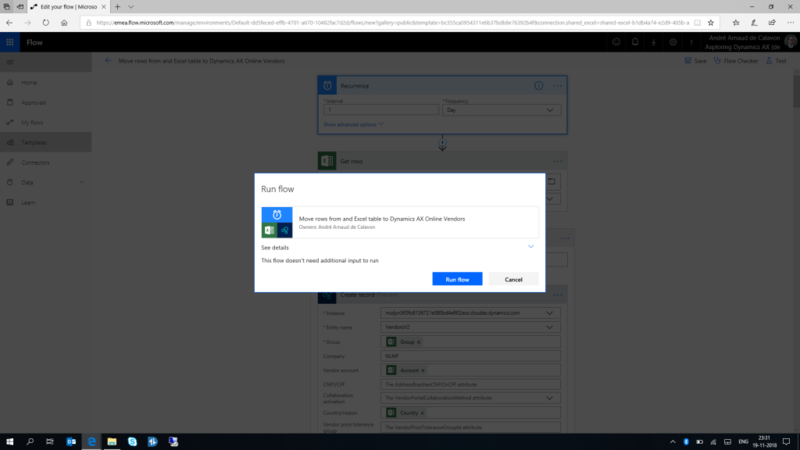 Click Run flow to continue executing the process. You will be directed to the execution page where you can follow the progress of your Flow. Also this same page can be used for analyzing results when you do encounter errors. The vendors are now imported in Microsoft Dynamics 365 for Finance and Operations. You can check the results in the All vendors list page or vendor details form. I used this exact procedure when I did start my Flow adventure. 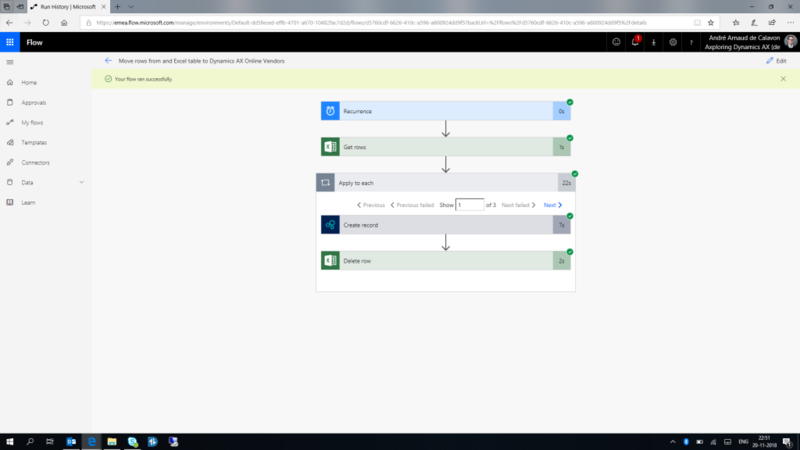 In my next blog (Part 2), I will explain the Create record action for Microsoft Dynamics 365 for Finance and Operations in more detail and will provide some additional tips. Thanks for sharing your knownledge and experience. Already looking forward to the details and tips of the next blog!